The complaint is processed and the Reported Company is contacted with the complaint details, furnished with all related documentation and given multiple attempts to respond to the allegations. If a response is received and the Reported Company wishes to dispute the complaint, ERAI will place the dispute under review and make a concerted effort to negotiate a resolution or mediation between the involved parties. 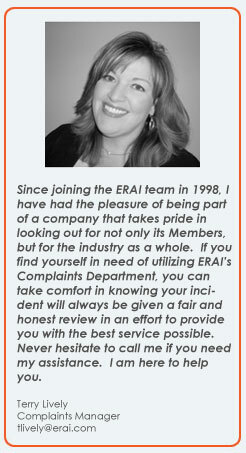 If a resolution cannot be reached and the Reported Company does not dispute the complaint or cannot substantiate their dispute, ERAI will report the incident as an Alert or Dispute Alert, whichever applies in that particular incident. If a resolution is reached that is agreeable to both parties, ERAI will hold the complaint pending the completion of the resolution. If either party does not comply with the resolution agreement, ERAI will re-open the complaint. If the Reported Company does not respond or dispute ERAI’s communication attempts, ERAI will proceed with reporting the incident. Click here to report a company to ERAI. For more information please contact the ERAI Complaints Department at (239) 261-6268.